﻿﻿Below are featured published novels that I did not write but edited. I am now an editor for the up-and-coming indie publishing company, The Polyethnic. The link to The Polyethnic's official website can be found below. 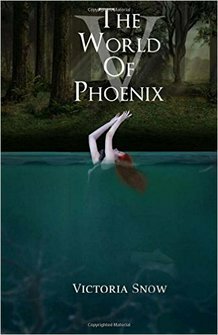 When a teenage girl gets caught up in a mystifying creature’s hunt for vengeance, Phoenix Blaze, otherwise known as V, will risk everything to keep the people she loves not just safe from her creator, but from her own bloodlust. Phoenix’s move to Portland was nothing short of a nightmare, especially when she is turned by her tormentor, Serena Bello, an enticing vampire. Now reborn, Phoenix is left with questions behind Serena’s motives in turning her, as well as her own questions. How will she survive her last semester of high school and protect the people she loves most from Serena’s fury? Well, that is, if her own lust for human blood doesn’t claim everything she cares about first. NOTE: The current cover image will not be the final cover for the published version. After suffering from a broken heart, fourteen-year-old Julie Campbelle is forced to move in with her estranged father in Malibu, California, when her mother is off to a business trip in Italy for the rest of the year. Despite not seeing her father for nearly four years, Julie is forced to build a bond with her new step family. When Julie attends Malibu High School, she suddenly falls hard for Ryan Moore, the captain of the Boys' Varsity basketball team. Meet Ryan Moore. He's fifteen years old and the son of the CEO of Moore's Architects. A lover of basketball, he suddenly falls hard for the new girl in town, Julie Campbelle. However, when the two find out about the truth that hid behind the past and present of their family's history, Ryan and Julie must keep their relationship a secret. But, as the secret unfolds and the custody battle swooshes in, Julie is forced to move to New York City, and it is now up to the young couple to fight for their long distant relationship. In a modern-day version of Romeo and Juliet, teen author, Melissa M. Futrell, brings you a story about two young lovers separated by a family rivalry so sick, you'd be at the edge of your seats. With a sprinkle of magic and several twists, the question brings us to: will you ever give up on the ones you love? What happens when you can't stop the voices in your head? Louisa Simmons is just another girl, invisible to the world, lost in the abyss of her thoughts, desperate for an escape. But can you really run away from yourself? Sam Mitchell is just another guy, on the verge of giving up, plagued by his past, unable to forgive himself for his mistakes. But can you really run away from the truth? Two broken people from two different worlds. Both alive but barely breathing. So what happens when two broken people collide? Will they learn to overcome the things that tie them down? Or will they lose sight of themselves in the process?